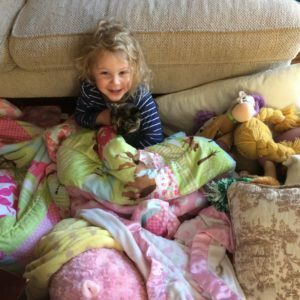 She has pronounced “Fort” as “Fork” every day for a week (while she has dismantled the couch and beds and proudly built and displayed her work in our living room). My kid outsmarts me every time. The cat came with that name. We got her off of Craigslist about a month ago, three weeks after Dancer died of some horrible and very fast acting virus that hit her suddenly and took her out in nine days. There’s no way I would know how much I could care for a little tiny creature but it was pretty sad day for me. Since all I would’ve posted would’ve been morbid, I refrained. I bleached everything and waited three weeks and this cat seems to be doing fine, thankfully! Her snuggle therapy with Pepe is also working out marvelously. A little slower than our much younger Dancer but coming along. These are my favorite types of Saturday mornings.